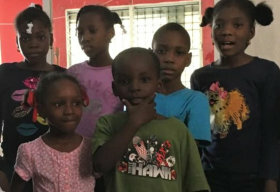 Haiti Health & Rehabilitation A Non Profit 501C (3) Organization 80-0603185 Mission To improve the quality of like in Haiti through healthcare, education. rehabilitation and nutrition. We want to improve the health and well being of the sick and the disabled. Vision We are dedicated to help guarantee the inclusion of persons with disabilities in every aspect of society, to analyze the impact of poverty and inequality on health, and to use these findings to educate people at all levels. Our Team Odette Constant-Little, RN BSN President/Founder Rudy Little, RN BSN Director of Operations Carl Vincent Manager/Treasurer Marie G. Denize, RN BSN Public Relations Dr Melissa Etheart Director of Health & Education Mrs Jackie Saint Albans Director of Operations Haiti.